Ram Mount Handlebar Rail Mount RAM-B-149Z-AQ7-2 consists of a zinc coated u-bolt base, double socket arm and small Aqua Box™ Pro 10 case. Included in this package is hardware that will accommodate rails from 0.50" to 1.25" in diameter. The base includes black cover caps to be placed over the exposed ends of the u-bolt. The included composite rail adapter can narrow the rail to a minimum width of 0.5". U-Bolt Dimensions:Accommodates rails from 0.5" to 1.25" in diameter. Fits Smart Phones Up To 5.38''(H) X 2.8''(W) X 0.55''(D) (depth will flex). Ram Mount RAM AQUA BOX case is weather resistant and splash proof, this unique patented design allows access to all side buttons on the phone while in the case. 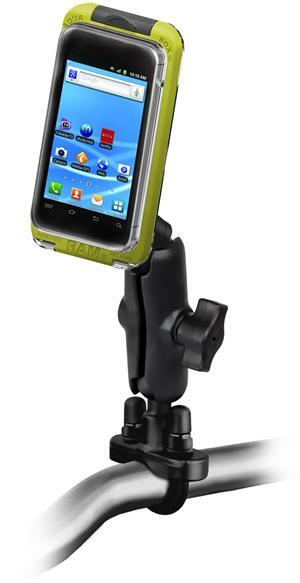 RAM AQUA BOX Fits Smart Phones Up To 5.38''(H) X 2.8''(W) X 0.55''(D) (depth will flex).